How are you all doing with your Year in Review album? 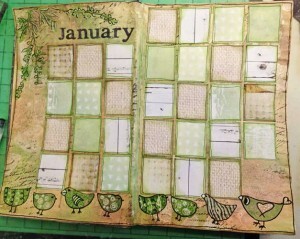 I started mine with a January calendar page. 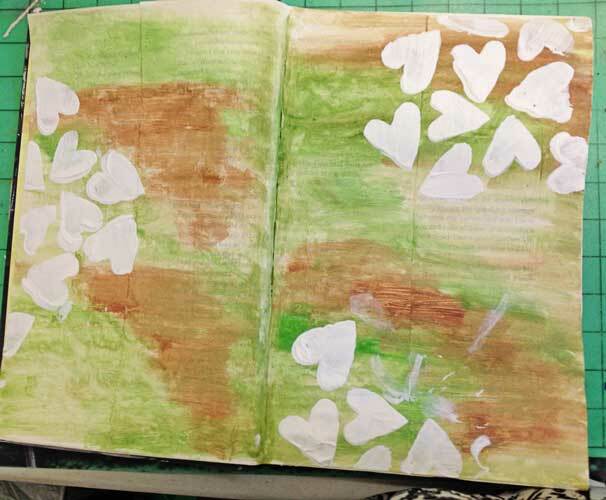 I love the calendar pages that Kate Crane makes in her art journal as part of her art calendar challenge, so I decided I would make one each month in my Year in Review album. 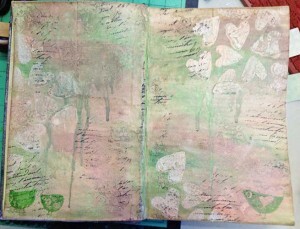 I have chosen to use an altered book for my album this year. I wanted to do this last year but decided against it as I was worried I wouldn’t fit the whole year into one book but this year I have decided it doesn’t matter if it doesn’t fit – I can just get another book (yeah I know – totally obvious but I couldn’t give myself that freedom last year). 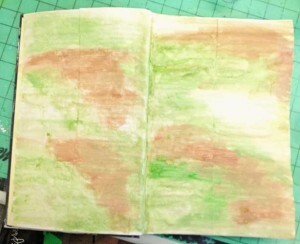 Firstly I swiped Distress Paint across the page and sprayed with a water mister to blend the paints. I also flicked some drops of water onto the paint while it was still wet to get a mottled effect. Colours I used were mowed lawn, anitque linen and vintage photo. 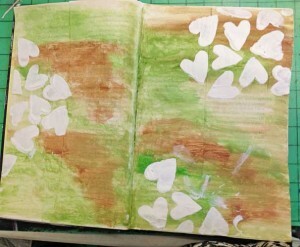 When it was dry I used my Crafters Workshop spilled hearts 6×6 template and gesso and added some hearts to the page. 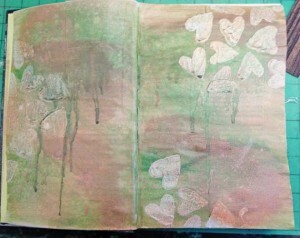 When the hearts were dry I sprayed the page with Heidi Swapp Colour Shine. I used coral and seafoam. 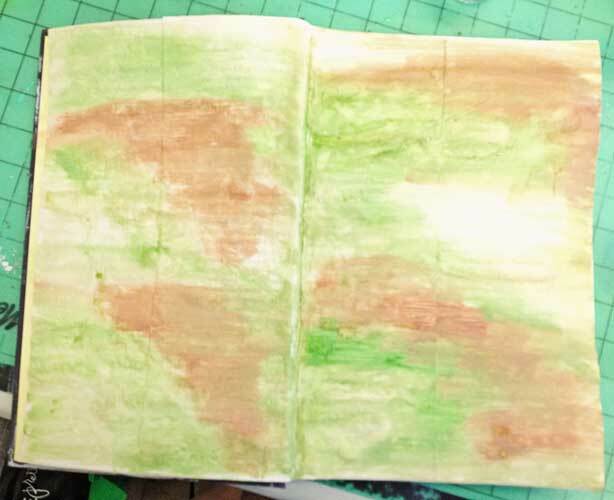 I held the book up and misted with water to create some drippage. For the next layer I stamped with two Darkroom Door background stamps – French script and button, using the rolling method I described in my last post. 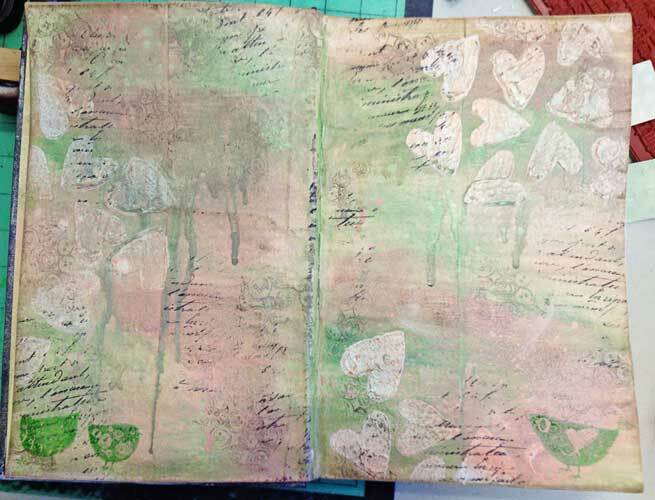 The script is stamped with black archival ink and the buttons with Gathered Twig distress ink (the buttons are very subtle and you may not be able to see them on the picture). I also used the Darkroom Door Carved Birds Vol. 2 and Mowed Lawn distress ink to stamp some birds on the bottom of the page. How cute are they? So loving that stamp set at the moment. I then cut 31 rectangles from some scraps of paper I had left. 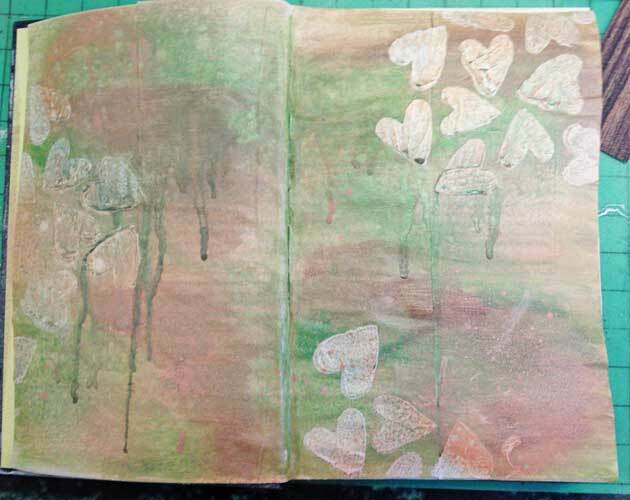 The papers were Shabby Chic from the Kaisercraft Basecoat 3 range and Excited and Salty Kisses from the Kaisercraft Paradiso range. I arranged the rectangles on the page to form the calendar. 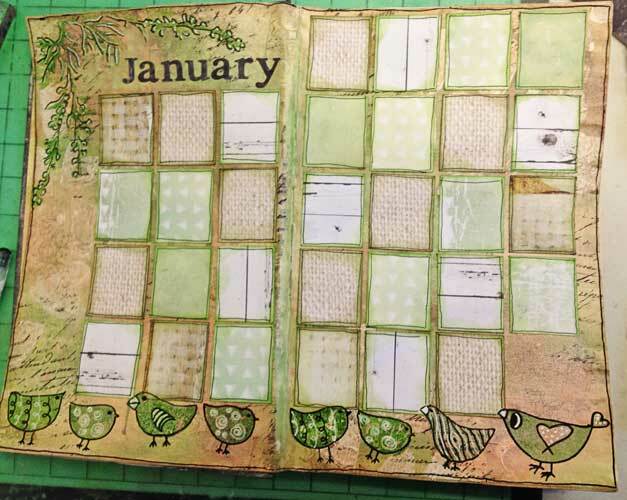 I stamped more birds along the bottom, stamped some foliage in the top left hand corner and added a title and some doodling and the page is ready for me to record one or two important events for each day. I hope you have enjoyed reading this quick step x step. If this has inspired you to create your own calendar page please share it by linking in the comments. I love seeing everyone’s creations. And don’t forget to check out Kate’s Art Calendar Challenge. WOW! I just love this and to see how it was created is just amazing. That was so inspiring I am off to give it a go, thank you so much!